Hello, again. I’m all a-twitter over coming back. As some of the more observant have noticed, I’ve been doing [url=http://freepbx.org/trac/changeset/7725]some[/url] [url=http://freepbx.org/trac/changeset/7723]commits[/url] to FreePBX recently. Does that mean that I’m back? Well. Yes. Yes it does. For those that don’t know, back in the mists of time – almost [url=http://freepbx.org/news/2007-06-22/time-for-me-to-hand-over-the-reigns]two years ago[/url] – I discovered that I had run out of hours in the day. This meant that I had to give up the most enjoyable hobby I’d had in years (FreePBX, that is. You with your dirty minds!) to concentrate more on stuff happening in the real world. Phillipe grabbed the ball and ran with it, and I have been exceptionally happy with where he’s taken FreePBX. Yes, of course I’ve been watching, and even occasionally updating my home FreePBX machine. I’m loving it. I have, however, been doing some low profile work for some long term VoIP customers here in Australia (Oh yes – I’m Australian for those that don’t know. I live in Queensland, on the coast. It’s great here! Uh.. unless you Americans want to come over. In that case it’s terrible, and we’ll feed you to the sheep) which is starting to bear fruit. This means that I can get paid for doing FreePBX work. And, of course, any FreePBX work must be GPL’ed (or [url=http://en.wikipedia.org/wiki/Affero_General_Public_License]AGPL’ed[/url], of which I will post about later) so I’ve been able to do some commits. Also in those two years, the Net has been evolving, and growing. 2 years ago, the Facebook App platform was released, which lead to the astonishing growth of Facebook into the dominant force it is today. Twitter wasn’t even AROUND. But they both are now. 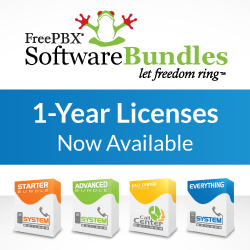 So, because I’m as cool, hip and froody as the next Pyro, I’ve started tweeting to the [url=http://twitter.com/FreePBX]FreePBX twitter account. [/url] This I hope to keep up for as long as possible, or until I get bored, whichever comes first! I’m also planning on having some sort of tweet bot that posts to a different account that alerts people of changes and patches, if they’re interested. Note that those accounts will solely be about FreePBX. I’ve got [url=http://twitter.com/xrobau]my own twitter account[/url] which will have general geekism and family stuff in there. Don’t subscribe to me unless you also want to have [url=https://twitter.com/xrobau/status/1833792436]random iPhone pictures of clouds[/url] and vitally important (to me) [url=https://twitter.com/xrobau/status/1810749451]baby status announcements[/url]. In summary – it’s great to be back. And I hope that everyone enjoyed reading this post as much as I enjoyed writing it. I’ll see you on IRC, or on Twitter, or somewhere in my travels.